Biggest Strength in 2016: Most teams break out in Year 3 of a new head coach, but Dan Hunt’s Raiders decided to break out after a 2-4 start and fired off seven straight wins, knocking out a Patriot League title contender (Lehigh) and three nationally-ranked teams (Fordham, New Hampshire, James Madison) as Colgate barrelled their way to the Patriot League Championship and an impressive run through the FCS Playoffs. Though they eventually fell to Sam Houston State in the FCS Quarterfinals, that momentum going into the season should be extremely helpful to the upcoming season. Biggest Challenge In 2016: Though their run through the late season and playoffs were indeed impressive, Colgate’s defense did make games a bit more interesting at times than necessary. Against Fordham, the Raiders gave up two touchdowns in the final 30 seconds and might not have beaten the Rams had a two-point conversion not fallen incomplete. Against Lehigh, the Mountain Hawks got first and goal under a minute to play before the Raider defense finally put them away. The challenge will be to avoid those sorts of situations in 2016. Biggest Departures: Amazingly, the Raiders don’t lose a whole lot from last year’s squad, but two sneaky losses from last season might be bigger losses than one might think. TE John Quazza was third on the team in pass receptions (475 yards, 4 TDs) and was and important blocker and red zone target, while one running back in the rotation, RB Demetrius Russell (654 yards rushing, 98 yards receiving, 6 TDs) also moves on. It won’t grind Colgate’s offense to a halt, but they’ll definitely need to be replaced. Players To Watch: The emergence of Colgate QB Jake Melville was a 6’1, 195 lb reason why Colgate won the title and beat two CAA teams in the playoffs last season. A great decision maker that doesn’t turn over the ball often, this dual-threat QB killed teams with both his arm (2,552 yards passing, 11 passing TDs) and his legs (1,171 yards rushing, 11 rushing TDs) last season. Raider fans are drooling imagining how good Melville can get in 2016, his senior season. Central to Melville’s success is a tremendous offensive line. Colgate’s hogs up front only allowed 13 sacks last season. and four of five starters return on that critical unit, including 6’2, 190 lb OL Ryan Paulish. 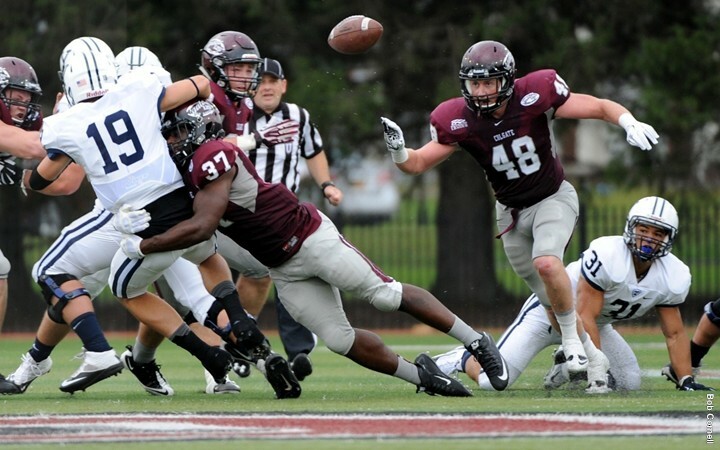 If it’s true that Colgate will only go as far as their defense will carry them, then the Raiders’ defense will hinge on the continued development of star DE Pat Afriyie (17 1/2 tackles for loss) and star LB Kyle Diener (129 tackles, 2 forced fumbles). Equally as interesting is the fact that the Raiders also return nine of eleven 2015 starters, which bodes well for continued improvement. Biggest Game: at Lehigh, 10/8/2016. Though Colgate is playing a 10 game schedule in 2016, don’t say that their out-of-conference schedule isn’t challenging, with three straight road games vs. Syracuse, Yale, and Richmond. There’s a chance that the Raiders end up 0-3 vs. an FBS team, a solid Ivy League team that beat them last year, and another FCS Playoff team before hosting tricky regional Rivals Cornell at home. From there it’s to Bethlehem, Pennsylvania, where the Mountain Hawks will undoubtedly have been stewing all offseason about the end of their Patriot League championship run in 2015. Even with some out-of-conference breathers before this game it would be a challenging contest – and if Lehigh can upend the Raiders in this game it could really put Colgate behind the 8-ball before the stretch run. Colgate In Two Sentences: Colgate’s amazing run last year, coupled by the fact that they return so much of the core of the 2015 squad, has to mean the Raiders have to be the team to beat this season in the Patriot League. Furthermore, if the defense makes an additional step towards becoming a dominant unit, another deep FCS playoff run isn’t out of the question.